During August 2006, a salvage excavation was conducted at Nein (Permit No. A-4861; map ref. 233225–250/726185–220), prior to construction. The excavation, on behalf of the Israel Antiquities Authority, was directed by B. Hanna, with the assistance of Y. Lavan (administration), V. Essman and T. Kornfeld (surveying and drafting), H. Smithline (field photography), H. Tahan (drawing) and D.T. Ariel (numismatics). The excavation area (50 sq m) was located along the eastern fringes of the village. 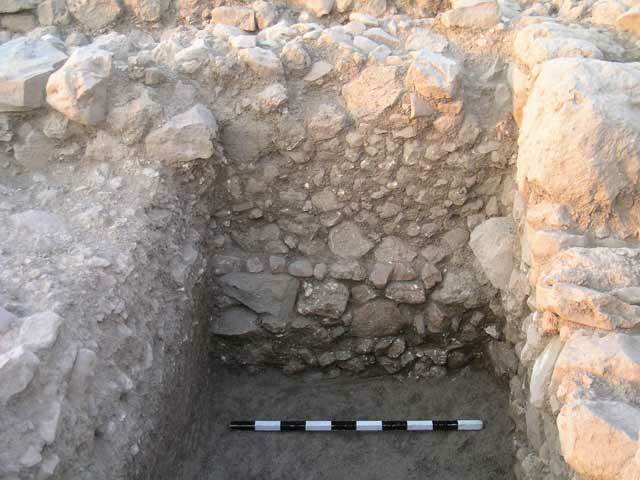 Remains of a building that dated to the Umayyad period were exposed and two construction phases were discerned (Fig. 1). 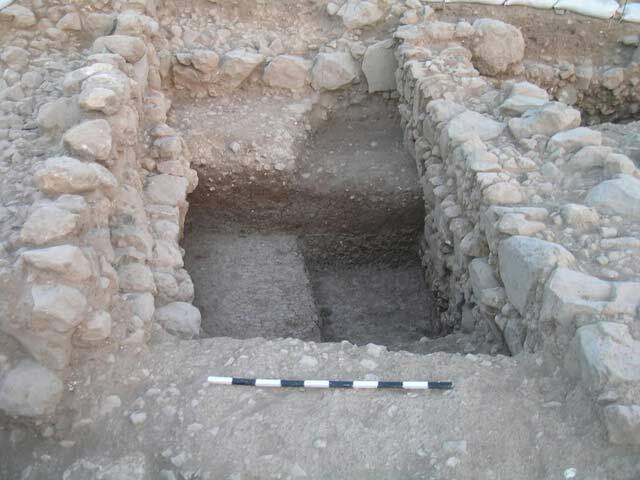 The excavation finds indicate that the Umayyad settlement at the site extended as far as the eastern edge of the village. Early Phase. 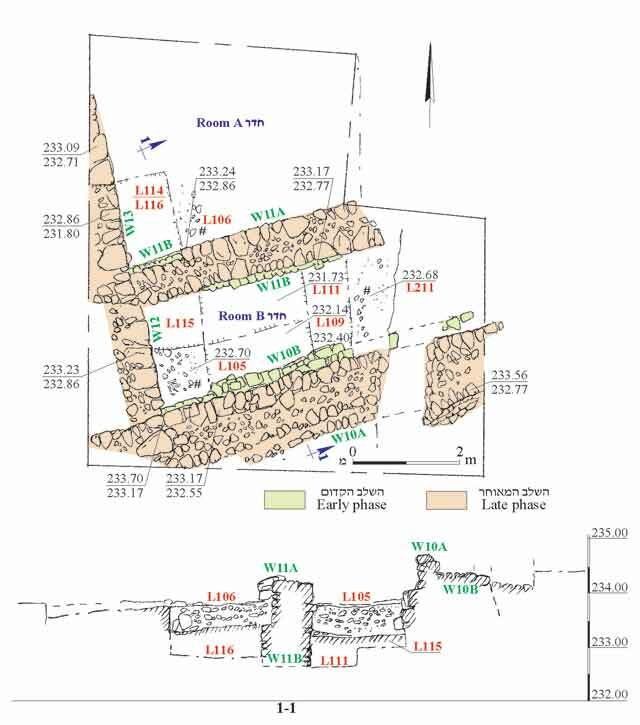 The corner of a room (W11B, W13), a floor (L114) and a farming terrace wall (W10B) were exposed. The walls, founded on sterile soil, were built of limestone and basalt fieldstones, some of which were roughly dressed. Walls 11B and 13 were preserved three courses high. The sides of the walls facing the interior of the room were lined with small stones. Floor 114 was also founded on sterile soil and consisted of tamped earth, a few small stones and some potsherds from the Umayyad period, including a jar (Fig. 2:3). The floor was covered with a layer of fill (thickness 0.5 m) that comprised numerous small stones, ash, lumps of plaster, pieces of mosaic and numerous potsherds from the Late Byzantine and Umayyad periods. Wall 10B was preserved four courses high; its northern side was built in a stepped fashion, whereas the southern side was not exposed because a later wall was built on top of it. Potsherds that dated to the Umayyad period, including a cooking pot (Fig. 2:1) and a jar (Fig. 2:2), were discovered in the fill that covered W10B. Late Phase. The remains of two rooms were revealed. The northern room (A) was enclosed within two walls (W11A, W12; Fig. 3) that were built on the wall remains of the early phase. The walls in this phase were made wider and the floor of the room was raised. The walls were built of limestone and basalt fieldstones; W11A was preserved two courses high, while W12 was preserved a single course high. 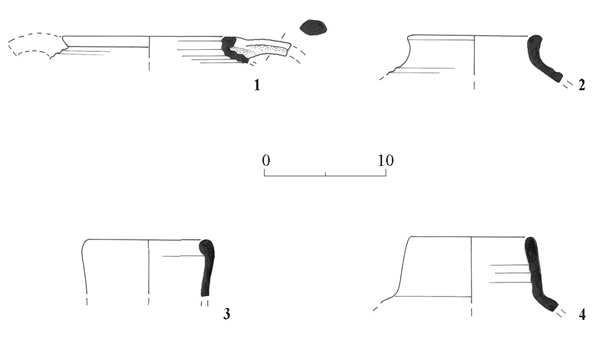 Wall 12 had cut Walls 10B and 11B of the early phase; its northern part was founded on W13 of the early phase and its southern part rested on the soil fill and ruins of the early phase. The room’s floor (L106) consisted of the fill that was placed on Floor 114 of the early phase and contained many small stones, ash, lumps of plaster, crushed chalk and numerous potsherds from the Late Byzantine and Umayyad periods. The southern room (B) was delimited by three walls (W10A, W11A, W12; Fig. 4). Walls 10A and 11A were built on walls from the previous phase while W12 that connected them was first built in this phase. Wall 10A was preserved four courses high and Walls 11A and 12 were preserved two courses high. The floor of the room (L105) was similar to the floor in the northern room. Potsherds that dated to the Late Byzantine and Umayyad periods, including a jar from the Umayyad period (Fig. 2:4), and an Umayyad coin (post reform; IAA 111867) were found on the floor. 3. Northern room, looking south. 4. Southern room, looking west.